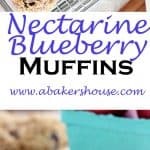 Today I’m sharing nectarine-blueberry muffins– the crumble topping is optional but oh-so-good. This recipe is one from America’s Test Kitchen. The original recipe called for a cranberry-pecan combination and I switched it up to use nectarines, blueberries, and walnuts. Create a pairing that fits with your taste and with the ingredients you have at home. Making these with fresh fruits from the local orchard or your own backyard would be a special treat! The #BreadBakers don’t let the hot summer weather get in the way of enjoying baking at home and you shouldn’t either! Yes, your kitchen will warm up slightly but the tradeoff is this bounty of summertime recipes below that highlight our theme this month: STONE FRUIT. Beautiful apricots, juicy peaches, fragrant cherries…stone fruits have a way of bringing summer flavors at their peak to your table in a way that you won’t mind heating up your oven. Let’s bake with fruit– try these recipes? 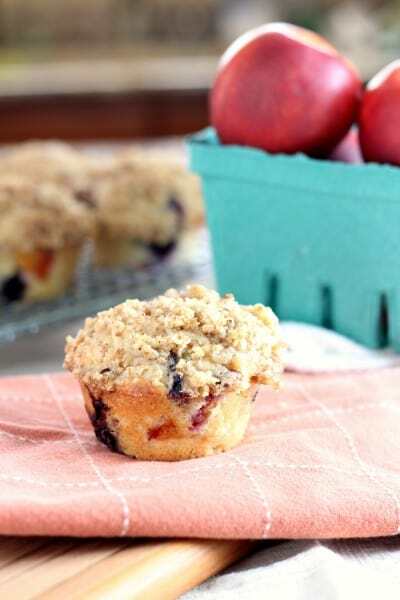 Nectarine-blueberry muffins-- the crumble topping is optional but oh-so-good. This recipe is one from America's Test Kitchen. The original recipe called for a cranberry-pecan combination and I switched it up to use nectarines, blueberries, and walnuts. Preheat the oven to 425 F. Line a muffin pan with 12 muffin baking cups or coat with baking spray. Make the crumble: combine flour, brown sugar, granulated sugar, butter, and salt in a food processor for a few pulses. Add the walnuts and continue to pulse for another 4-5 times. Set aside in a small bowl. Make the muffins: Combine the flour, baking powder, and 3/4 teaspoon of salt in a bowl. Whisk gently. Pulse the walnuts and granulated sugar in the food processor until well combined. Transfer to a large bowl and whisk in the milk, eggs and melted butter. Whisk the flour mixture into the milk mixture until just combined. Let sit for 30 minutes so that the batter thickens. 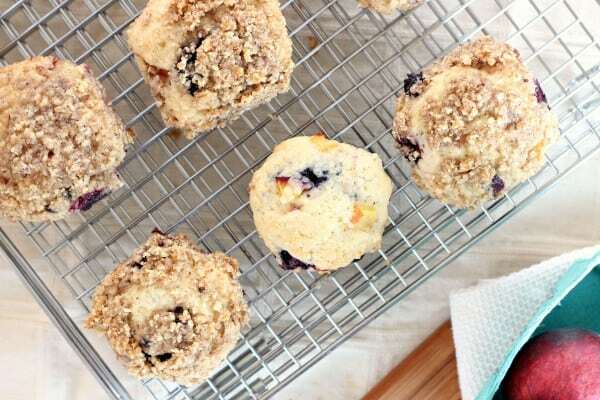 Gently fold in the nectarines and blueberries into the muffin batter. Scoop the batter into the 12 muffin cups. Top with the crumble mixture, gently pressing the crumble into the tops of the muffin batter. Bake for 18-20 minutes or until muffins start to lightly brown on top. Cool for 10 minutes in the tin then transfer to a wire rack to cool for an additional 15-20 minutes before serving. Recipe comes from America's Test Kitchen's recipe for Cranberry-Pecan Muffins. Source: Step by Step Holiday Baking 2015-16 edition, page 82. We take turns hosting each month and choosing the theme/ingredient. 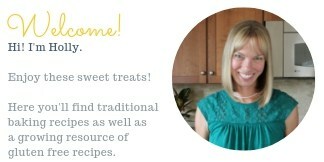 Thanks goes to Mireille of The Schizo Chef this month for organizing the group. The other day I was at the store and walked by a big bin of nectarines and the smell was incredible. I need to go back and get some to bake these muffins. Yes, it is the smell of so many of these stone fruits that really brings the feeling of summer home with you! Delectable sounding muffins! I love the flavor combinations! a perfect fruit combo for muffins! Thanks, Anne, I love the summer season of baking! We too are big nectarine fans, I’m loving the theme this month, so many fruity muffins to try! !! 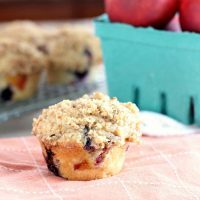 I am getting nectarines to make these muffins really soon! Lovely pick for breadbakers!! Crumble top on the muffins gives a great texture while eating. Wonderful…….. I love this combination of flavors. As usual, another wonderful recipe. I could eat a dozen! Delicious and flavorful combo muffins. Yummy looking muffins. Love the addition of nectarines and blueberries. These look delicious, I love muffins with a crumb topping.